Registration certificate, as it is known, is issued by the military, when a person reaches the age of 16. 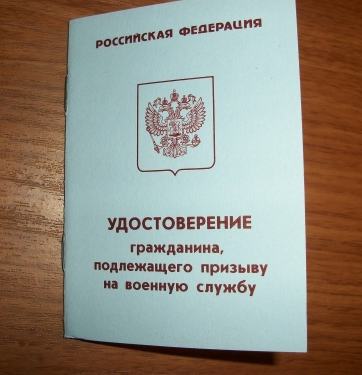 This document indicates that you are a recruit, and the youth of premilitary age, military service or nevoennaya. If registration certificate is lost, it is necessary to recover. - reference from place of study. Before going to the recruiting office, make a photocopy of your passport and high school diploma. Go to school and take the characteristics and help if you are studying in school. If you are a student of a higher educational institution, the certificate must be made by the Dean. The photo booth take photos. In the passport office to take a certificate of family composition place of residence. Go to the recruitment office and write a letter to the head of Department VC that registration certificate is lost and you want to restore it. If you do not live at the address of residence, and in another city, then to simplify stand on temporary military registration at the place of residence. In recruiting employees time come and pick up the document. Be careful. Today, there are many scammers who are trying to sell ready-made registration certificate. All this can be done for free, you just need to collect all the documents and go to the draft Board. Only it should be done as soon as possible, as this document is required for registration and many other documents (e.g., passport). In addition, the registration certificate is required for admission to higher educational institutions. Even if you have lost the registration certificate, you will not be able to apply penalties as per the law is not spelled out. Terms of the restoration document needs to check with the recruiting office staff. If you can't come to the military enlistment office yourself (for health reasons), then get your registration certificate can any of the parents. In this case, they will need to write a statement on his behalf with a request to restore the document.